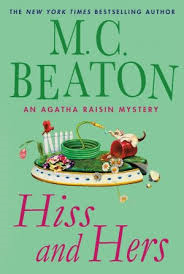 I'm always thrilled to see a new Agatha Raisin mystery. Her latest adventures are chronicled in the book Hiss and Hers by M.C. Beaton. As usual, Agatha is short-tempered and man-hungry, yet somehow she manages to solve mysteries that have the police stumped. Agatha is a 50-something owner of a detective agency in the picturesque Cotswolds. She lives in a thatched cottage with her two cats, Hodge and Boswell. Her ex-husband, James Lacey, lives next door, but as he's a travel writer, he's frequently away from home. She also has an on again/off again relationship with Sir Charles Fraith, the flighty and somewhat undependable peer who drops into her life from time to time, only to disappear again without warning. So Agatha is an easy target for the latest unattached man to move to the village, the hunky gardener George Marston. Her garden has never looked so beautiful, as she's constantly calling George over to work on it. She never misses an opportunity to flirt with him, and he seems receptive, so she's hopeful that there will be a romantic relationship soon. To move things along, she arranges a charity ball and gets George to promise her the first dance. At the ball, however, George is a no-show. Agatha determines to get to the bottom of why he stood her up, so she goes to his cottage. To her dismay, she discovers George dead in his backyard. After the police arrive, they discover that George was killed by being drugged and then having a bag of poisonous snakes tied over his head. All that idyllic living in the countryside surely does create some colorful killers! George's sister hires Agatha's agency to look into the circumstances surrounding George's death. As Agatha and her staff begin to research George's life, she is quite upset to learn that George was having affairs with nearly every woman in the village over the age of 50 -- except her. Agatha spends a lot of money on personal maintenance. Every time she sees another of George's "frumpy" conquests, we are treated to a catalog of her expenses for tweezing, plucking, dying, etc. Unfortunately, she also smokes and drinks and subsists on microwave meals, so throwing money around is perhaps not the most practical physical fitness solution. As Agatha and her crew get closer to the solution, someone begins a campaign to throw her off the track. She has excrement pushed through her letter box, is sent a box of chocolates (that proves to contain yet another snake) and a woman sitting in her garden is murdered (apparently mistaken for Agatha). To make matters worse, her old friend Charles has gotten engaged, which makes Agatha even more desperate about her husband-less state. I enjoyed Agatha's antics, as always, even though there were some things that were rather glossed over. For instance, when Charles and his new love go to France, Agatha is able to "go on the computer" and find out what hotel they're staying in. Say what? Later on, Charles goes online to find all the hotels in town and resorts to the old-fashioned method of calling them to find out which one Agatha is staying in. While this approach makes more sense, I have to wonder if modern security policies would allow employees to give out information of this sort. Still, these are minor quibbles. I really enjoyed my visit with Agatha and her friends (and cats). I can only hope she's gearing up for a new adventure soon!